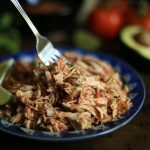 This slow cooker salsa chicken is by far the easiest meal I make, other than standing over the counter eating cold pizza. 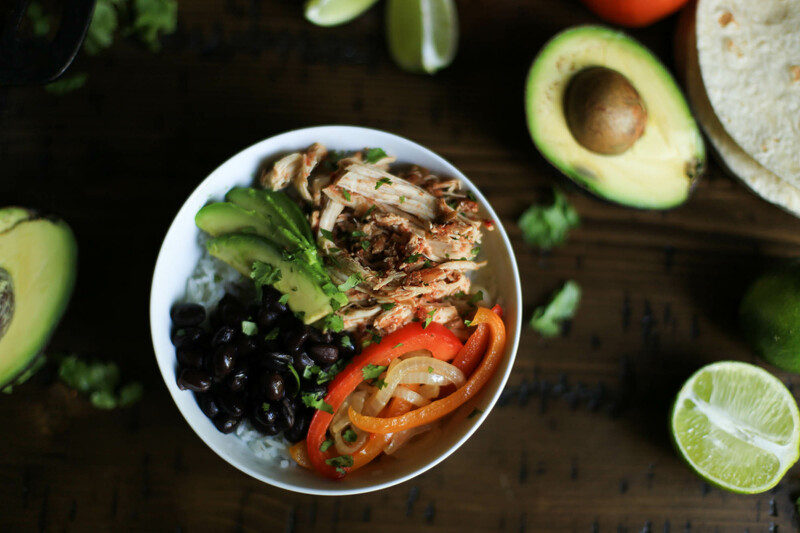 Two ingredients, that’s it: a jar of your favorite salsa, to add a ton of flavor to basic chicken breasts, and turn them into supper. 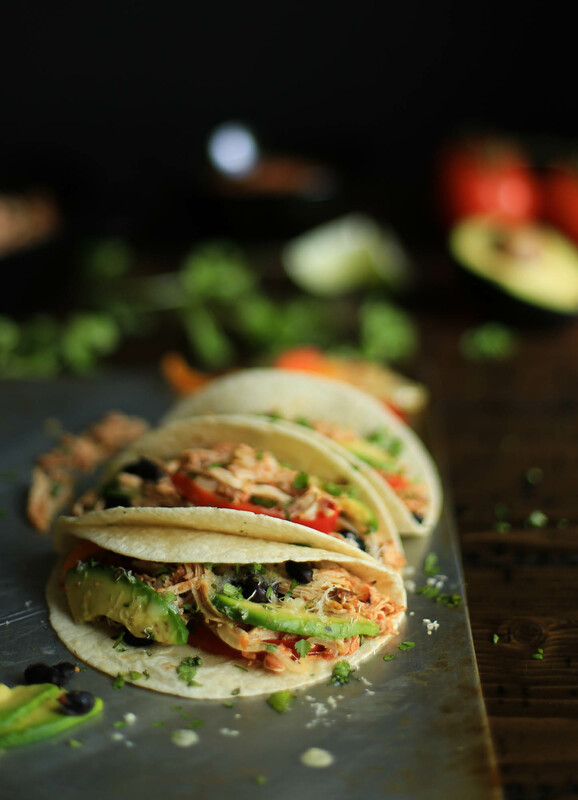 Add fresh ingredients to the shredded chicken and make any meal you want. Ridiculously easy, right? I don’t consider this an original recipe to The District Table, I’ve seen it all across Pinterest before. Mainly, it’s a recipe that I really really want to share with you in case you’ve never heard of it. Because honestly, it’s embarrassingly simple and wonderful. I want to make sure everyone knows this is an option for dinner. From beginner cooks to experienced ones. There is one catch. You knew it was coming. …The recipe does take five minutes to prep. Sorry about that, no way around it. Five minutes to add a liner to the slow cooker, place the chicken in, and top it with salsa. or you can serve the chicken straight to kids! There is no wrong way, everyone could even have a different thing. You put the chicken in the crock pot and walk away. Once it’s done, shred it up like a boss. Then pile on your favorite toppings to make a nutritious dinner that your entire family will eat. 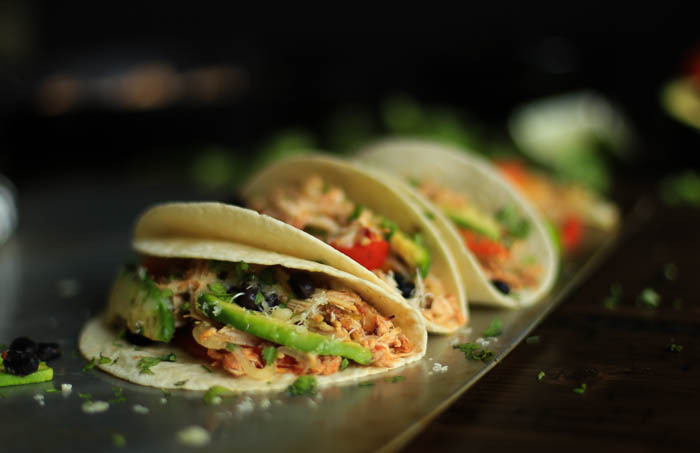 Think onions, avocado, sour cream, shredded cheese, or cilantro. Do your thing. Sometimes I add a can of black beans and a cup of frozen corn to the slow cooker too, if I want more variety. 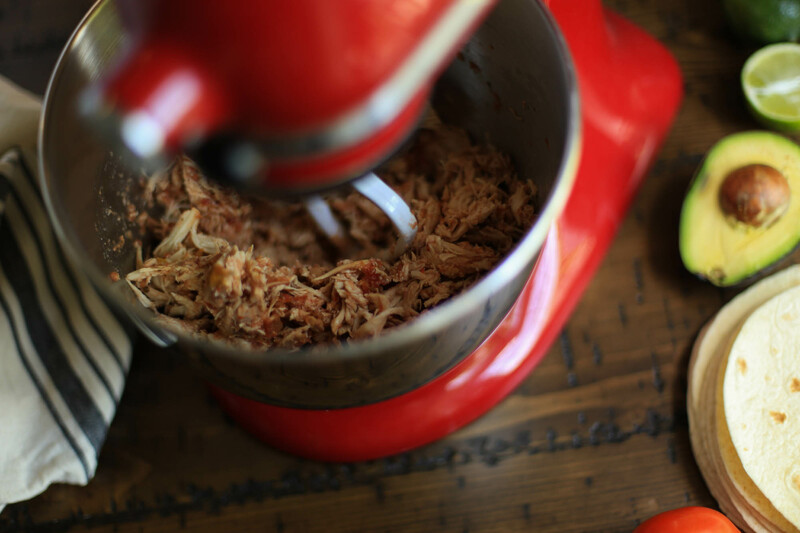 To save your arms all that effort of shredding chicken with two forks (this recipe equals the opposite of effort) you can place warm chicken breasts in your KitchenAid mixing bowl and stir with the paddle attachment. In less than a minute the chicken will be shredded and ready to eat. Yes, it’s shockingly easy. Also, wonderfully delicious, and healthy, and flavorful, and tender. 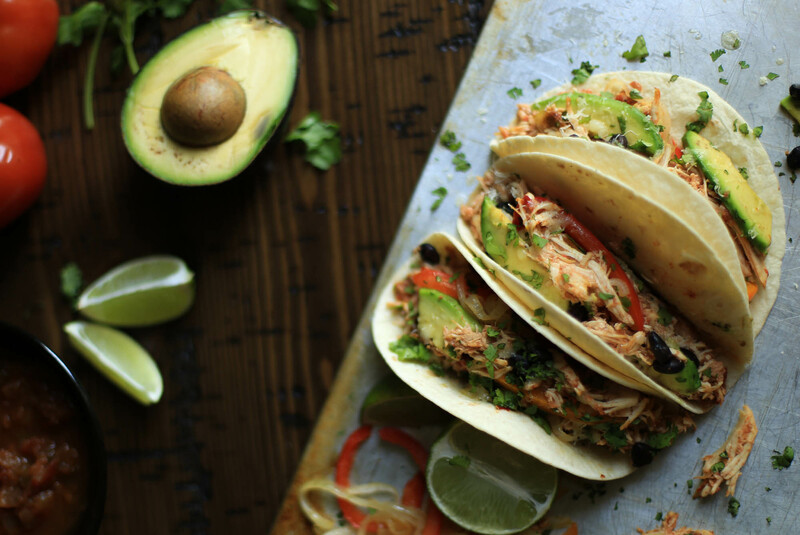 I used this recipe often for Whole30 prep, and it’s Weight Watchers friendly too. This is for real, guys. Try it. Place the chicken breasts in the slow cooker. Season with salt and pepper. Pour the salsa over the chicken and toss to coat the chicken. Cover and cook on high heat for 4 hours, or on low heat for 6-7 hours (until the chicken shreds easily with a fork). Either shred the chicken with two forks, or place in a KitchenAid bowl and stir on low for one minute with the paddle attachment. 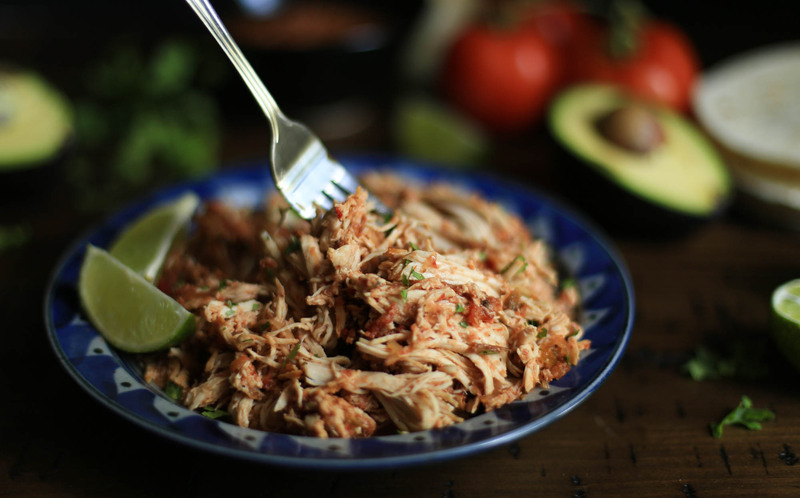 Toss the shredded chicken with the salsa and juices left over in the slow cooker and serve. Makes about 6 cups of chicken, shredded. The shredded chicken also freezes well for future meals.